Sign Up for Online Rent Payments - And Earn $50! Sign Up for Online Rent Payments – And Earn $50! Imagine if paying rent each month was a simple as hitting a “pay now” button from an app on your cell phone from the comfort of your home. No more dragging yourself off the couch to run a rent check down to the manager’s office, praying you get it in before the cutoff time. Say goodbye to post dating rent checks prior to a vacation that falls on the first of the month (and crossing your fingers the manager doesn’t cash it before your paycheck hits your account). 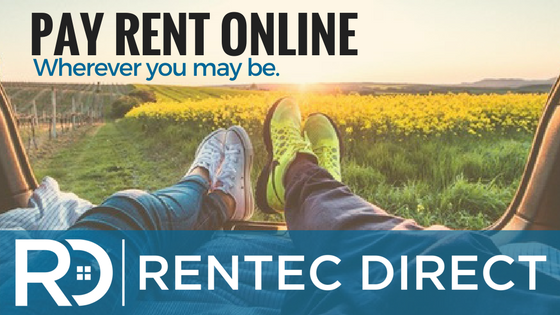 Rentec Direct offers renters convenient ways to pay rent online through a Tenant Portal you can access on your smart phone or mobile device. You can link your bank account to your online portal to pay your rent each month automatically or schedule one time payments via checking account or your debit/credit card. Online rent payments are easy and convenient for both renters and rental managers. What exactly is Rentec Direct? Rentec Direct is a software company that your landlord or property manager will use to manage their rental property. It essentially organizes all their properties and renter data, tracks rent payments and late fees, and lets them send and sign lease documents with their renters online. That’s just a few of the things that Rentec offers rental managers, but we don’t need to bore you with any of those details. The best thing Rentec offers renters are online rent payments via the FREE Tenant Portal. All you have to do is get your landlord to sign up for Rentec Direct, and then they can start collecting rent from you via the Tenant Portal. What’s more, we will even pay you – the renter – for recommending Rentec Direct to your landlord (we offer renters a $50 referral bonus!). Tell your landlord or manager to sign up online or let our team at Rentec Direct convince them of the benefits. Just email us at sales@rentecdirect.com and say you want your landlord to sign up for Rentec Direct and we will take it from there! Remind your landlord that if you pay rent online, the payment will automatically show up in their bank account, significantly improving their workday with less trips to the banks and less time spent entering payment data into their books. How do I get a $50 Renter Referral Fee? If you get your landlord to sign up for Online Rent Payments with Rentec Direct, we will send you $50. If the first of the month ever falls on a weekend, or even a weekday, forget having to find your pants and leaving the comfort of your latest Netflix binge. Just log into your Rentec Direct Tenant Portal on your smart phone and schedule an online rent payment.